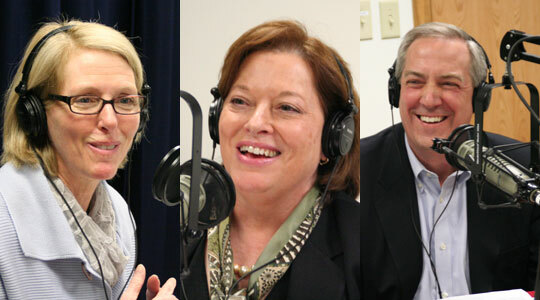 Summary of today’s show: Scot Landry welcomes members of the Catholic Appeal team for the Archdiocese of Boston, Kathleen Driscoll, Mary Doorley, and John Riley, and they discuss the critical support provided by donors to the Appeal to the 50 ministries that support parishes, schools, and other Catholic organizations in the areas of strengthening families, enriching parish life, inspiring future generations, and supporting Catholic leadership by the Cardinal and vicar general. 1st segment: Scot said the Catholic Appeal is the annual effort by the Archdiocese of Boston to raise the funds necessary to run the important central ministries that support our parishes and schools and other ministries. This past weekend was the kickoff of the Catholic Appeal and included either an audio or video presentation by Cardinal Sean. Scot welcomed Kathleen Driscoll, secretary for institutional advancement; Mary Doorley, and John Riley, chair of the Catholic Appeal Committee. Kathleen said the appeal launch went very well. They got positive feedback and they are thankful to the pastors and the more than 100 parish appeal volunteers who helped out. Scot asked about the appeal coordinators. Mary said the coordinators help the parish fully implement the appeal and then also give the people at the Pastoral Center insight into what’s working and what can be improved. The coordinators also address the appeal for parishioners in the parish, giving a witness talk after Masses, for example. Scot said it’s one thing to hear the appeal homily from Cardinal Sean or one of the priests, but it makes a difference to hear a lay person in the parish. John said having the witness from someone informed about the appeal and is in the parish week after week with local credibility links the parish with the archdiocese. Mary added that anyone interested in being an appeal coordinator to contact them through BostonCatholicAppeal.org. Scot said Msgr. Deeley said on Friday that the Appeal provides the foundation for every ministry in the Archdiocese, whether it’s directly funded by the Appeal or not. Scot said the Appeal materials have a new look and feel. Kathleen said the goal was to put a face on the appeal and make it less institutional. It helps people meet those who benefit from the ministries funded by the appeal. The theme is the Good Samaritan, which is someone who helps someone he never knew before and will probably never see again. The materials have just four examples of the 50 ministries doing this work day in and day out. She said it was challenging to identify the 50 ministries funded by the Appeal within the four profiles of real people in the brochure. These are real people who are helped. Scot said the story of Georgia on the website with a video about her and a video with her pastor about the collaboration needed to make their parish accessible for people with disabilities. The video shows what a difference it’s made in the life of Georgia and her family to be able to attend Mass. Mary said there are so many aspects of parish life that can confound the pastor and the parish council. That’s where the central ministries can provide expert help. Scot said some people say they five to their parish so why do they need to give to the Appeal. John said many don’t realize the extent of the Archdiocese’s activities. The Archdiocese also links our local parish to the universal Church in addition to linking the local parishes together. We are all called to be missionaries and one of the ways we do that is through our support of the Appeal. Scot said Cardinal Sean has said that as he travels he hears about the reputation of the Archdiocese for generosity beyond our diocesan borders. Kathleen said she and Mary and John were able to go out last fall to thank lay volunteers in parishes. She said she has learned Marriage Ministries has offered pre-wedding counseling to hundreds of couple. Every year there are more than 4,000 weddings in parishes. The pro-life office has helped more than 400 women choose life for their babies. The religious education office oversees the formation of over 130,000 children. People in the parishes tell her they had no idea how big the ministries are. The appeal’s goals break down into four categories: strengthening families, inspiring future generations, enriching parish life, and supporting pastoral leadership. John said there is so much happening at the parish level and there are so many resources in the office of the Archdiocese that support that. Small schools have those resources, parishes have those resources, religious educators have them. It’s encouraging him as a parent to see the wonderful work happening in the parish and the dedication of the volunteers in those ministries and to know that there’s a large number of resources to support those works. It’s not just front-line ministries like religious ed, but also the real estate office and risk management and more. John said there are extraordinary people in the archdiocese who dedicate their careers to advancing the mission of the Church. They bring skills and their faith together to advance the work of the Church and his way to support them is by supporting the Catholic Appeal. Scot said about 250 people work in the Pastoral and about 2000 people work in the parishes, not including the schools, and about 30000 who volunteer. Scot spoke about the Marriage Ministry program, “Transformed in Love”. This is available to everyone in the Archdiocese because we have this central marriage ministry to coordinate. Kathleen said it’s almost a new day now where we’re looking ahead to ask how we can make our ministries the best. Scot said the Office for the New Evangelization of Youth and Young Adults is another office supported by the Appeal. Mary said there is also college campus ministry, which is on about 20 college campuses throughout the Archdiocese. The vocations office has also done so much to bring about many more vocations, which is due to prayer and the generosity of parishioners that make it possible. Scot recalled how Fr. Mark O’Connell reflected how he has benefited over that past 20 years from the generous donors to the Appeal. Kathleen also pointed to the many men who point to World Youth Day with the Office for the New Evangelization of Youth and Young Adults as the linchpin for their vocations. KAthleen said they’re thankful for anyone who’s made a gift and listeners are interested go to the website http://www.bostoncatholicappeal.org. 2nd segment: Scot asked Mary about the ministries within the area of enriching parish life. She said the Office for Spiritual Life offers archdiocesan-wide program like Arise and Why Catholic? Also, offices like Clergy Personnel and the Permanent Diaconate. There are also offices that help with the practical matters in parishes: finances, real estate, human resources, insurance, and more. Scot said these behind the scenes ministries enable parishes to invest those resources into other ministries on the parish side. John said it’s important to build up the business partnerships that will help you. It’s impossible for a parish to have all the resources they need, but they still need them. The archdiocese brings those resources together through the skills of the wonderful people who have those talents. Pastors and business managers can pick up the phone and have someone to call. Mary said the more efficient we can make parishes by helping them with risk management and avoiding other problems, then the more time the pastor has for ministry and the better use we’ll be making of the dollars people donate. Scot said one of the major changes in the last six months in the Archdiocese has been learning the new prayers for the Mass and the Office for Divine Worship has been the major reason it’s been implemented well because of the training sessions for priests and liturgical ministers and music ministers as well as providing so many resources in use in parishes. One of the top priorities for Cardinal Sean in the next couple years is pastoral planning to prepare parishes for the future. John said we are a constantly changing society and we are the same in the archdiocese. There are resources dedicated to trying to identify the needs over the next fifty and 100 years and how do we plan for that as an archdiocese. We can’t do that as effectively on the parish level as we can on the archdiocesan level. For the last three months the archdiocesan Pastoral Planning commission has been out hearing from people in the parishes their opinions and feedback. Scot said the next broad area is advancing Church leadership, including the ministry of Cardinal Seán. The cardinal is the leader of the archdiocese, but he relies on the day to day basis on the assistance of the vicar general and moderator of the curia, Msgr. Robert Deeley. John added that the regional bishops also work with Cardinal Sean in carrying his vision out to the different regions of the Archdiocese. Mary pointed out that we are the fourth largest archdiocese in the country. Mary said the Catholic Appeal team is grateful for all the input of lay leaders, including those on the Catholic Appeal committee. There is also a pastors advisory committee, who give advice on everything from design of the materials to the resources that they will need. Anyone who wants to make a gift today can do so at BostonCatholicAppeal.org.